Since the toxic mold litigation case of Ballard vs. Fire Insurance Exchange in 2001, Architects and building owners have been increasingly concerned about the liability caused by the presence of mold on occupant health and indoor air quality. The Ballard case shows that juries were willing to award multimillion dollar judgments against insurance companies for liability involving mold contamination.1 Frequently involved as defendants in mold contamination lawsuits, Architects are beginning to question if the 'old "rules of thumb" about designing for moisture control in the building envelope' may be contributing to the moisture building-up in some buildings2. Fortunately, there are a number of software applications that can help Architects evaluate the effectiveness of their envelope design. 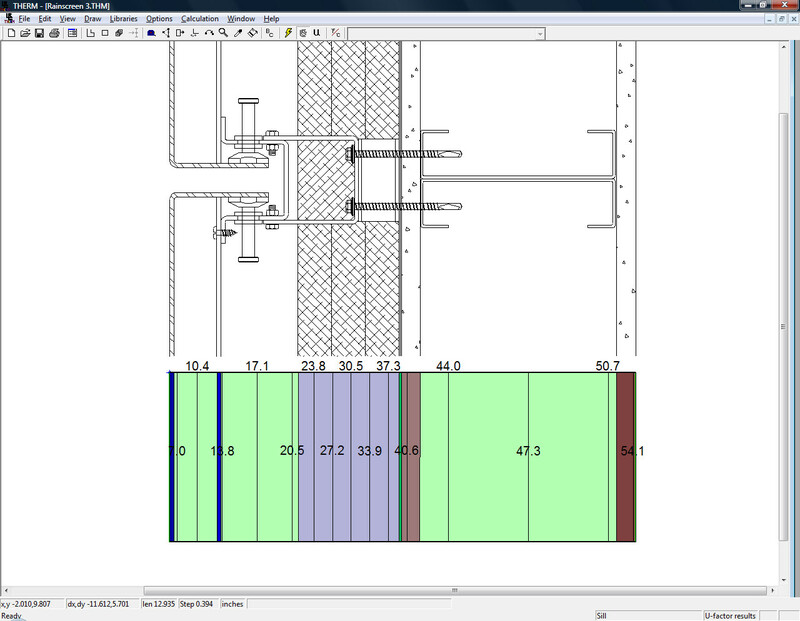 This article will investigate two free envelope analysis programs: THERM and WUFI. THERM is a free program provided by the Lawrence Berkeley National Laboratory to analyze two dimensional heat transfer through building products. WUFI-ORNL/IBP, a joint development between the Oak Ridge National Laboratory and the Fraunhofer Institute, is a hygrothermal model that predicts moisture transport in building envelope systems over a period of time. The Ventilated Rainscreen is a cladding system that Architects and product manufacturers have embraced in their effort to improve the moisture performance of traditional metal panel cladding systems. This study will use THERM and WUFI to compare the performance of the Rainscreen system against the traditional metal panel system. 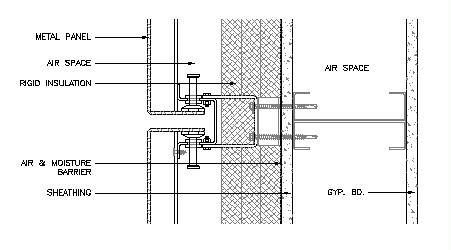 The traditional metal panel system is mechanically fastened to a metal stud wall. Between the metal panel and the building enclosure is a layer of air permeable waterproofing material such as building paper (asphalt impregnated paper) or building wrap. The stud cavity is insulated with batt insulation (mineral fiber). Between the metal studs and the interior gypsum board is the vapor barrier. 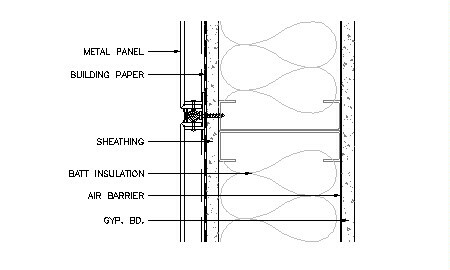 The vapor barrier keeps warm, moist air from entering the wall cavity. The ventilated Rainscreen separates the exterior metal panel from the building enclosure with a ventilated air space and a layer of rigid insulation. Instead of allowing air to pass through the waterproofing layer, the waterproofing layer is also an air barrier as well. The stud cavity is uninsulated and is not sealed with a vapor barrier. Therefore, air from the building interior can dry out the stud cavity. This study uses LBNL THERM software3 to compare the thermal performance of Metal Panel assembly and the Ventilated Rainscreen assembly in a cold, urban climate such as St. Louis, Missouri. The 99% Winter Design Condition data from the St. Louis Lambert International Airport shows air temperature of 6 °F (-14.5 °C) and Dew Point of -6.5 °F (-21.4 °C). The indoor temperature is set for 68 °F (20 °C) with 50% Relative Humidity (RH). Figure 3 is a THERM color infrared diagram of the temperature model across the metal panel section. The color diagram shows that the most dramatic temperature difference occurs in the batt insulation, where the temperature drops from 58 °F to 10.3 °F from the room side surface to the outside surface. Any moist air that leaks through a penetration in the vapor barrier will probably condense when it hits the cold outside surface. The thermal analysis suggests that there is a great risk of moisture build up in the wall cavity of the traditional metal panel assembly. 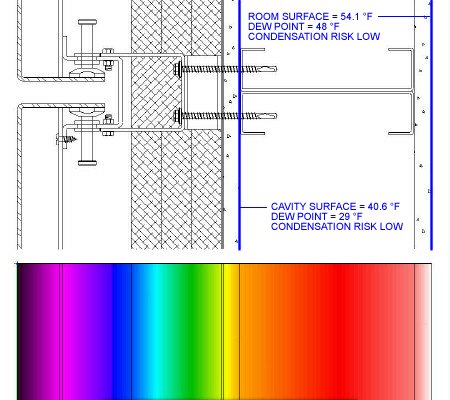 Figure 4 is a THERM color infrared diagram of the heat transfer model of a Ventilated Rainscreen assembly. The major temperature change occurs in the rigid insulation outside the building enclosure. Heat from the room is able to warm up the stud cavity above the dew point. The thermal transfer model suggests that there is low risk of condensation. 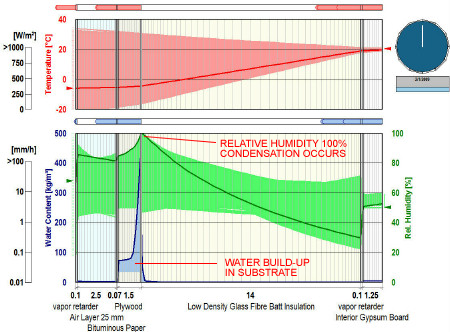 The dew point analysis in Table 1 illustrates how heat transfer analysis can be used to determine the risk of moisture. THERM predicts the temperature across the various components of an assembly; however, it does not model the moisture content. The user has to draw on other resources to predict the risk of condensation. 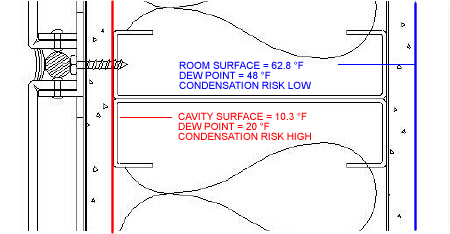 I used an online Dew Point Calculator4 to find the dew point in the wall cavity. 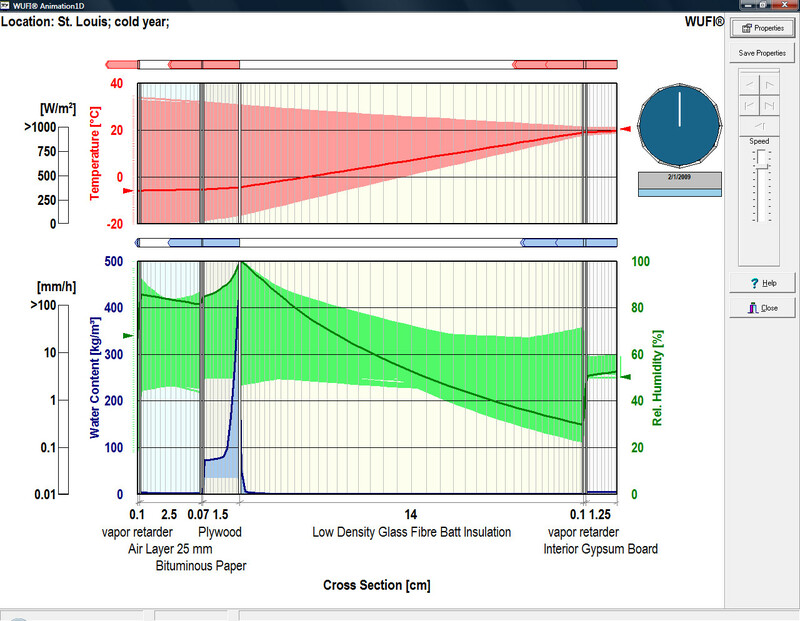 WUFI-ORNL/IBP5 can calculate the thermal and moisture transfer within an assembly over a period of time. This study compares the Metal Panel and Rainscreen assembly in St. Louis, MO from September 22, 2008 through February 1, 2009 (Winter). 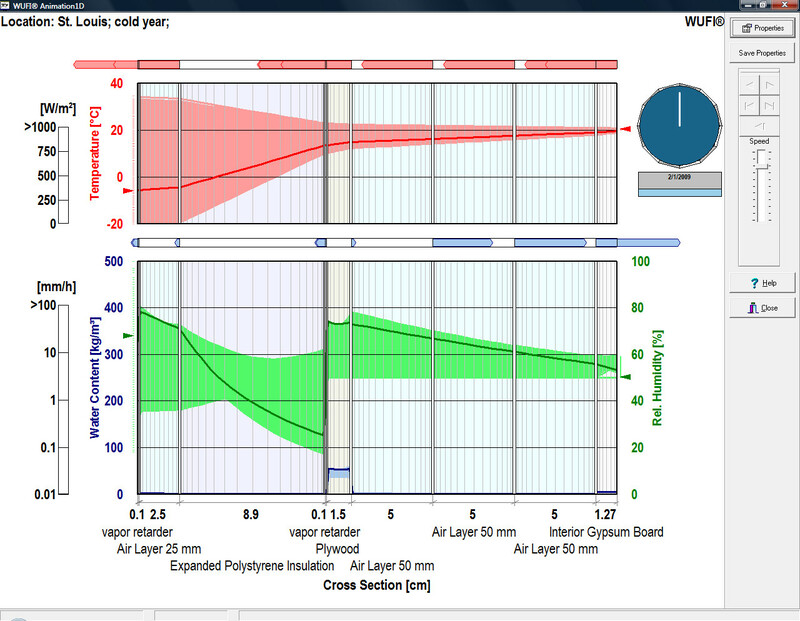 WUFI's interface includes an animated chart that tracks changes in the following data over the time period: temperature (RED), relative humidity (GREEN), and water content (BLUE). The user can see if and when relative humidity reaches 100% and condensation starts to collect as water content in building components. Figure 5 shows that relative humidity (GREEN) in the Metal Panel stud cavity reaches 100% (condensation occurs) during the calculation run period. Additionally, the water content (BLUE) spiking up in the Plywood substrate confirms the presence of water in the stud cavity. The calculation results are animated so the user can see condensation in the wall cavity beginning in December and ending in February. The relative humidity in Figure 6 Rainscreen Calculation remains within the normal range (20%-80%) throughout the run period. There is no significant water content increase in the assembly. The calculation results suggests low risk of moisture build-up in the Ventilated Rainscreen assembly. 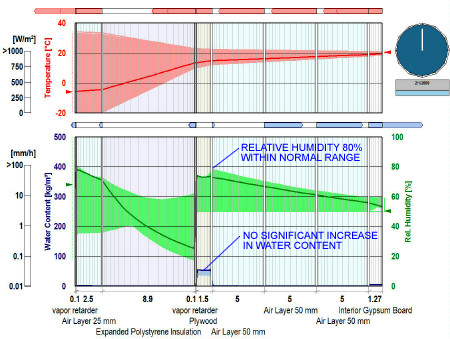 WUFI tackles the problem of condensation and moisture build-up more directly than THERM. It predicts when condensation will occur and how much moisture will be in an assembly over a period of time. The main drawback of WUFI-ORNL/IBP is the limited library of building materials and the lack of options in building material thickness. For example, insulation comes in thicknesses of .089m and .140m. The user cannot build up insulation in 1 inch (.025m) increments. The free version does not allow the user to edit or add to the materials library. THERM is less sophisticated than WUFI but is more flexible. 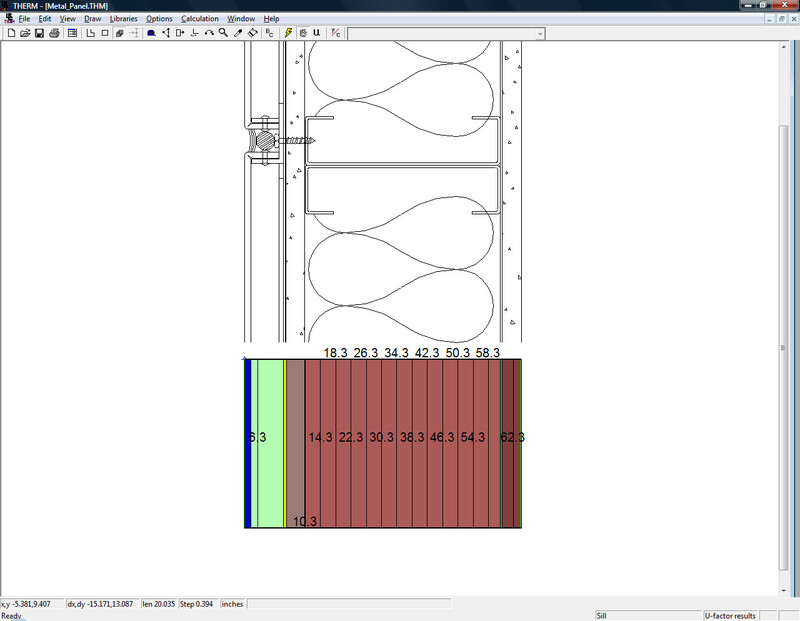 The user can draw the assembly in question and model it in THERM. Also, THERM can be used to calculate heat transfer at windows. Overall, this author was able to reach the same results using THERM and WUFI. They both predicted low risk of condensation in the Ventilated Rainscreen and high risk of condensation in the Traditional Metal Panel. If the user does not have any real life experience to validate the results of either program, it does not hurt to use one programs to validate the results of the other.